All the main beats from the movie are there, thanks in no small part to a great book by Jessie Nelson. 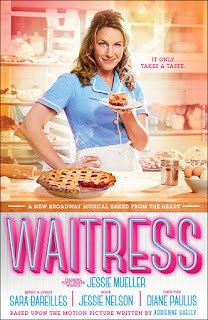 Waitress tells Jenna's story. She's the titular waitress, working at Joe's Diner. (Owner Joe (Dakin Matthews) is a regular at his roadside diner.) She has a knack for making delicious and creatively-named pies. She's also stuck. 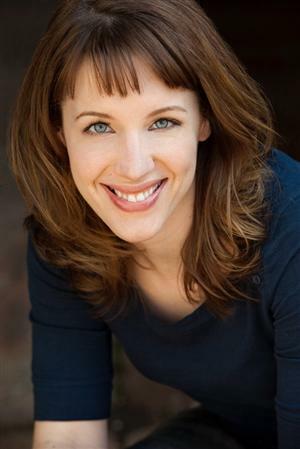 Jenna (Jessie Mueller) lives in a small town, and is in an unhappy marriage with Earl (Nick Cordero), who is a controlling and insecure brute. After a drunken night with said hubby, Jenna finds herself pregnant. One of the other female relationships is between Jenna and her late mother. Her mother's been gone for several years, but Tony-winning director Diane Paulus (Hair, Pippin) and choreographer Lorin Lotarro stage the show in such a way that Mom, who taught Jenna to bake, is ever-present. It's a nice touch that I don't remember being in the movie, and it works to connect the mother-to-be with her mother. Being pregnant, Jenna goes to the doctor, only to find that her regular doctor has retired, and she's now in the care of the young and handsome Dr. Pomatter (Drew Gehling). Do you smell an "affair to rememberry" pie in the oven? Good nose. Jenna and the doc quickly take up together, but it doesn't go where you think it will. Jenna's journey does lead her to love, but not with someone else. Throughout the whole show, she's searching, trying to figure out who she is. Tony winner Jessie Mueller (Beautiful) is terrific. She has a natural charm so you like Jenna right away, but Mueller is fearless in presenting Jenna as a layered, complex person. After all of Jenna's searching, she realizes and comes to terms with who she was, who she is, and who she wants to be in the potent 11 o'clock number, "She Used to Be Mine." Mueller will blow you away. Some things on stage are different from the way they were on screen. I'm thinking in particular of the way Ogie (Christopher Fitzgerald) is introduced. Ogie is Dawn's love interest, and I remember that in the movie, he seemed a little stalkerish. Not so here. And Fitzgerald, the impish performer who originated the role of Boq in Wicked, delighted my fellow audience members with his two big numbers, "Never Ever Getting Rid of Me" and "I Love You Like a Table." I feel like I'm doing a lot of reporting on the plot. There's a lot going on, but none of it feels rushed or cramped or overwhelming. Ideas—good and bad—are given time to develop and flourish in pop singer-songwriter Sara Bareilles's score. The music is pop-inflected, which isn't a surprise and isn't categorically a bad thing. (I'm a strong supporter of scores being in the characters' vernacular.) Some of the tunes sound indistinguishable or are forgettable (though the voices bring them to life, and, especially in Mueller's case, elevate them). Some tunes are good, or work particularly well in a musical as a storytelling device. (I'm thinking of "Bad Idea," which builds and builds while Jenna and Dr. Potmatter get cooking.) One surprise is "A Soft Place to Land," a trio for the three waitresses. It has a different mood and tone than the rest of the score; it's soft, dreamy, and unexpected. I also liked the key of Jenna and Dr. Pomatter's first duet, and was touched by the tenderness in their second act number, "You Matter to Me." I noted before that one of the most resonant aspects of the show is the relationship among the women. This is, undoubtedly, what happens when you have women at the helm. Waitress is groundbreaking in that it is the first musical on Broadway with an all-female creative team (director, book writer, songwriter, and choreographer). As Jenna learns, women are enterprising, smart, capable people, and their voices matter. Order up!